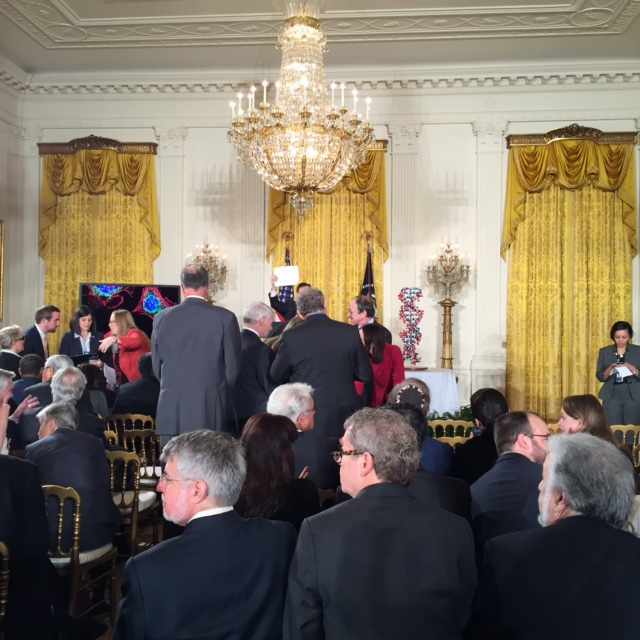 Former Medical Director of the Center for Individualized Clinic, Gianrico Farrugia, is currently in the East Room of the White House awaiting the unveiling of the Precision Medicine Initiative. Mayo Clinic is excited about the national focus on individualized medicine, and what the future holds with this $215 million investment. 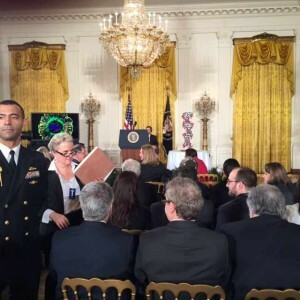 The Precision Medicine Initiative proposes a joint investment into the National Institutes of Health (NIH), the Food and Drug Administration (FDA) and the Office of the National Coordinator for Health Information Technology (ONC). Better Treatment for Cancer: The National Cancer Institute (NCI) will accelerate the design and testing of effective, tailored treatments for cancer by expanding genetically based clinical cancer trials, exploring fundamental aspects of cancer biology, and establishing a national “cancer knowledge network” that will generate and share new knowledge to fuel scientific discovery and guide treatment decisions. Creation of a Voluntary National Research Cohort: The NIH in collaboration with other agencies and stakeholders, will launch a national, patient-powered research cohort of one million or more Americans who volunteer to participate in research. Participants will be involved in the design of the Initiative and will have the opportunity to contribute diverse sources of data—including medical records; profiles of the patient’s genes, metabolites (chemical makeup), and microorganisms in and on the body; environmental and lifestyle data; patient-generated information; and personal device and sensor data. Privacy will be rigorously protected. Commitment to Protecting Privacy: To ensure from the start that this Initiative adheres to rigorous privacy protections, the White House will launch a multi- stakeholder process with HHS and other Federal agencies to solicit input from patient groups, bioethicists, privacy, and civil liberties advocates, technologists, and other experts in order to identify and address any legal and technical issues related to the privacy and security of data in the context of precision medicine. Regulatory Modernization: The Initiative will include reviewing the current regulatory landscape to determine whether changes are needed to support the development of this new research and care model, including its critical privacy and participant protection framework. As part of this effort, the FDA will develop a new approach for evaluating Next Generation Sequencing technologies — tests that rapidly sequence large segments of a person’s DNA, or even their entire genome. The new approach will facilitate the generation of knowledge about which genetic changes are important to patient care and foster innovation in genetic sequencing technology, while ensuring that the tests are accurate and reliable. Public-Private Partnerships: The Obama Administration will forge strong partnerships with existing research cohorts, patient groups, and the private sector to develop the infrastructure that will be needed to expand cancer genomics, and to launch a voluntary million-person cohort. The Administration will call on academic medical centers, researchers, foundations, privacy experts, medical ethicists, and medical product innovators to lay the foundation for this effort, including developing new approaches to patient participation and empowerment. The Administration will carefully consider and develop an approach to precision medicine that ensures consumers have access to their own health data – and to the applications and services that can safely and accurately analyze it – so that in addition to treating disease, we can empower individuals and families to invest in and manage their health.